Proper microscope use is crucial for scientists of any age. A laboratory or classroom can be a complicated place, and knowing microscope safety is important. A microscope may seem like a mundane instrument, but improper handling can cause serious problems. Everyone in the lab or at home should know the basics of microscope safety. It goes without saying that to practice microscope safety you must first know your instrument. Take the time to read the manual, or listen to the teacher's instructions on how everything works. Don't touch any controls without knowing what they do, and turn all knobs slowly. Proper attention paid to learning your microscope in the beginning can save injury to the instrument or yourself. After all, it's a crying shame to break your microscope right after you buy it! Proper handling - An obvious yet important rule of microscope safety is to carry the unit properly. Always carry the microscope with both hands. One hand should support the bottom, and the other should have a firm grip on the arm. Be sure to carry it high enough so that it does not bump against anything. Respect the light source - Another microscope safety step that is important to follow has to do with the light source. If the microscope uses a mirror, one should never use direct sunlight to light a specimen, as it can cause severe damage to the eyes. Protect your eyes by following this rule! When it comes to lighting, it's a good practice to shut off the light when not in use. This will save energy, protect the specimens, and improve the longevity of the microscope. It will also keep the light from getting too hot to the touch. 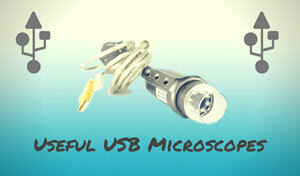 Some microscopes may have mercury lamps. Mercury is a dangerous substance and it is important to follow your manual for microscope use closely. If there is a mercury lamp explosion, the lab often needs to be evacuated and sealed until the proper department can clean up the mess. Watch those slides - It's always important to follow microscope safety when handling glass slides and covers, as glass slides could break and cut you. Additionally, chemicals and specimens on the slides could be harmful. If a slide does break, it is important to notify the teacher or head of the lab. They can recommend the proper methods of disposal. Since most slides are covered with chemicals or biological substances, extra vigilance is recommended. Users should always wear proper clothing and protective gear as needed. Food and drinks should be kept out of the workspace, as they can potentially contaminate the slides. 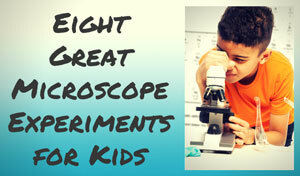 Proper microscope care - Taking proper care of the microscope is another important part of microscope use and safety. For example, the lenses are very delicate and should not be touched directly. Touching the lenses can cause smudges, possible scratches, or even a break that could cut someone. 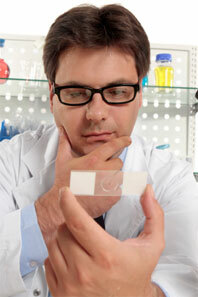 If the lenses become smudged, use a special lens paper to clean them instead of putting pressure on them with a cloth. Cleaning and storage - Another courteous part of microscope use is proper cleaning. The glass slides and cover slips should be cleaned and put away properly. The microscope itself should also be cleaned, so carefully remove any smudges from the lenses and wipe the stage down thoroughly. When storing the microscope, place the objective lenses on the lowest setting. Use the coarse adjustment to put the nosepiece on its lowest setting. Make sure the light is shut off. These steps of microscope use will keep the unit in good working order as well as make it ready for the next user. A special word about cleaning: Be sure to clean and disinfect the eyepiece! The eyes, nose, and mouth spread germs and bacteria very easily, and it's realistic someone could catch an infection from a dirty eyepiece. So wipe it down well with a soft cloth and disinfectant glass cleaner after every use. Microscope safety isn't complicated. Often it requires the user to think ahead and be courteous to others. Clean, carefully handled microscopes will last a long time and provide many educational opportunities for years to come. Learning proper microscope handling will keep you safe, and the lab or classroom running smoothly!